Can a textbook be exciting? Fundamentals of Theatrical Design is very exciting. The volume has the power to inspire as well as inform, and college theater departments that don’t adopt it as part of their book lists are missing out on a real treasure. The two authors love theater, know theater, and know how to teach about theater—and it shows. 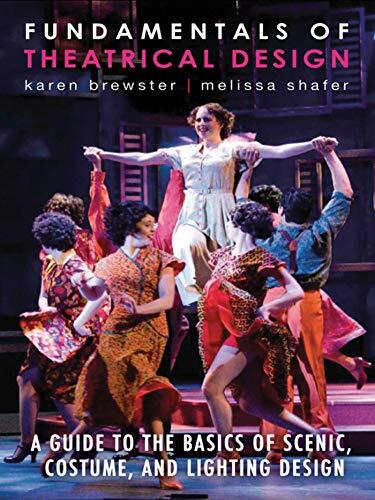 One has the feeling that a book containing nothing more than their own significant knowledge of stagecraft would have been a valuable resource in and of itself; however, Ms. Brewster and Ms. Shafer didn’t stop there. They interviewed working professionals in every part of the profession and added a wide range of information to the mix. They gathered theatrical design insights from actors, playwrights, producers, and stage managers to add to their own data. The book’s title is somewhat misleading. At first glance it seems like yet another volume on how to build scenery. Fundamentals of Theatrical Design is so very much more. The book is divided into four parts, and each part examines another aspect of the art and profession of theater. The first chapter of part one is titled Script Analysis for Designers and begins with a section called How to Read a Play. It’s immediately obvious that this is not just a book about how to pound nails into scenery flats. This is rather a book on how to become a useful member of the creative team that gathers to make good theater. The authors teach readers how to examine a play script in much the same way that an actor reads it when preparing to play one of the roles. The chapter is a well narrated roadmap to play reading with clear examples. For example, the authors guide readers into world of Given Circumstances. That is the territory where the playwright and the players meet. The Given Circumstances include such details as where the play is set. Those who wish to interpret a play need to think about the time and country of the action, the cultural background of the characters, the manners and even the political climate of the time. The instructive section is followed by a set of exercises to illustrate the process. That’s just the first chapter. The book hardly ever loses steam. Every following chapter uses the same approach: details, examples, and exercises. Chapter two asks the creative team to dig deeper into the themes and meanings of the play and to study the characters. Chapters three and four begin to look at the work process. The authors don’t just tell readers to research, they explain how to research and how to make the process a rich experience. They do the same in their chapter on collaboration. It’s all about respect for the art form and mutual respect among the team players. That paragraph could serve as a guidepost to every theatrical production. Parts Two and Three deal with the visual and practical aspects of theater design. The scenery, costumes, and lights are all given full attention. Sub-chapters such as The Psychology of Color, Balance, Proportion, and Rhythm break the process down to very clear and digestible portions. The book never lingers in the flowery land of art for art’s sake. The authors understand the practical world of budgetary and time constraints, and they reveal that world with plain, direct language. Again, there are exercises that bring home the points of every major section. Part Four, called Epilogue, could become a book on its own. It covers a number of practical facets of building a career in theater design. Everything from applying for jobs, through preparing resumes and portfolios, and facing the interview is discussed. The authors’ voices echo throughout the book. It’s a kindly, but direct voice. It’s obvious that these teachers walk the walk and work hard to help their students succeed.